Are lilac root systems invasive to water/sewage lines? We are being told that my mother's lilac bush' roots have grown into the neighbor's sewage lines, causing backup. 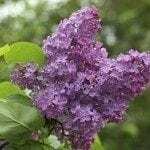 Lilac roots will grow into sewer lines, depending on the variety you have. For example, shrubs usually have more shallow root systems than tree forms. The roots will follow the path of least resistance where water, air and nutrients exist. Planting the lilacs 8 to10 feet away from the sewer line should be more than enough distance. As a general rule, tree roots will extend up to 2.5 times the height of the tree, and some species of trees may have roots extending five to seven times the height of the tree.